Many databases containing items from a variety of locations allow users to use a drop-down menu to view an inventory of specific locations. Make certain you check out any listing that could be statewide or for more than one location. 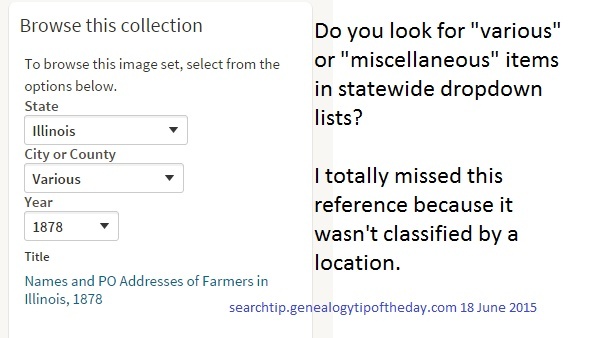 I almost missed an 1878 farmers’ directory in Illinois because it was classified as a “various” location. This entry was posted in Uncategorized on June 18, 2015 by mjnrootdig. Would you be so kind as to reveal where you found this farmers directory? I have great-grandparents that lived in Hanover twp. Cook County and am hard pressed to find information about them other than census records. Hi Marge. I live in Elgin, close to the Hanover Township line. I also have access to directories that I believe include Hanover Twp. Can you post your ggrandparents names and the time frame of when they lived in Hanover Twp?